Bits of Splendor: The Speak Louder Project! I also have a heart and a passion to make a difference through my life. It's a deep, undeniable, desire for my life to make a difference in someone elses. Which is why this blog came about. But a point has come where my words and my passion have collided and are simply not enough. A point where I'm ready to ACT. And this is where the "Speak Louder Project" begins. You see, God has given each and every one of us an opportunity to shine, to teach, to bless, to inspire, to make a difference. And it's up to us to make those opportunities happen. To take the steps forward...one by one, little by little, moment by moment. So today, I come to you with an opportunity. To make your actions speak louder than words. To take a step in meeting a need. Speak Louder Project comes from a heart and desire to inspire others to move. To encourage through our words, to give where there is a need, to speak where truth needs to be known, to love where hearts are broken....to ACT. I mentioned a ministry in my previous post called Agora Ministries. A couple in our church has been involved in this ministry for years. They have amazing, humble hearts. They are making a difference. And yet, they don't ask for recognition..for reward, for gratitude. This couple ministers to a part of our city few are aware of. It is known as the poorest zip code in the nation. They hold a service each Friday night that ministers to the need of the community and about 35 youth from ages 6 months to 19 years old attend this service. I wanted to bless these kids in some special way with something for Easter. After a few conversations with the couple it became obvious that instead of an Easter basket, book, or even candy...these kids are in need of shoes. I want to meet that need....But I can't do it alone! I believe that when there is a need and that need is made known to good hearted people...that need can be met! I believe there are others who want to SPEAK LOUDER. Who want to ACT. Who want to show God's love! Is that you? Then here is a chance to let that happen! Give a child in need a pair of new shoes for Easter! Imagine where your donation can lead...where those feet will go and who they will inspire! Donations can be made through Heart of Praise of Worship Center and will go toward purchasing a pair of shoes for each of these kids. 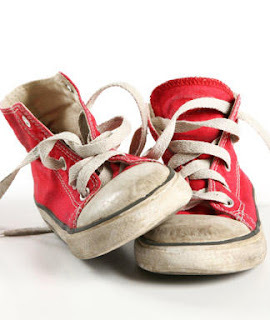 My hope is to meet the goal of $700 by Wednesday, April 20th, in order to hand the shoes out to the kids on that Friday before Easter, April 22nd. You can make a donation through paypal. It will go directly to Heart of Praise and the purchase of a new pair of shoes for one of these 35 kids. To keep up to date on where we are with our goal, be sure to check back here! I'm excited to see what God is going to do through YOU! They must be an amazing couple!! Writing a check now! Thanks for this post! Can't wait to see the pictures of the shoes being delivered. Your doing a great thing for these kids! Keep up the good work Laura! the Speak Louder Project- Shoe Shopping!! A 1950's Vintage Desk Makeover! Spring Fun with the Target Dollar Spot!